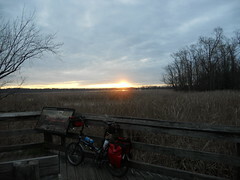 Bike Commute 135: Little Nellie Greets the Dawn, a photo by Rootchopper on Flickr. I haven’t seen a sunrise in a while but the shift to standard time and the shortening of the day gave me a nice surprise this morning. The sun is rising farther downriver giving me a slightly different angle on the proceedings from my usual perch on the boardwalk in Dyke Marsh. The next time I see a sunrise will be Wednesday when it will be about 20 degrees cooler. I can’t say that I am looking forward to the cold. I thought of Raspberry Beret and Pink Cadillac but they are cheating. And then there’s A Day in the Life (I read the news today, oh boy…) but that’s worse. Then the ride was over. Not much of a list but I suppose you all could add to it. Give it a go. Update: Thru the miracle of social media we have these additions. The last of these brings to mind the first album I owned by my own self. Snoopy and the Red Baron by the Royal Guardsmen. Mainer Renee Olin showed her new southern roots by adding Rednecks, White Socks, and Blue Ribbon Beer by Johnny Russell. I have a friend who seems to defy gravity. Her name is Florencia, but most people call her Flor. Ironic, no? Well, Flor is very passionate about nutrition, mental, physical and spiritual, health and exercise. I first met her on the 50 States Ride in DC. It was a brutally hot day and the route was very hilly. Most of us were slogging up the hills in our granny gear. Flor was floating, dancing effortlessly on her pedals. She barely seemed to break a sweat. As it turns out, she also climbs rocks, Big ones. Cliffs actually. The kind that most mortals wouldn’t even think about. When I saw some pictures of her dressed all in black climbing some impossibly scary looking wall of granite, I called her spider woman. For mind and body, Flor likes to do yoga. Of course, for most people this is an earth-bound activity. Not for Flor. 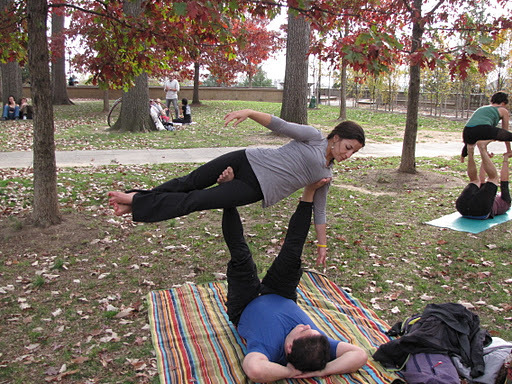 Her latest passion is acroyoga. 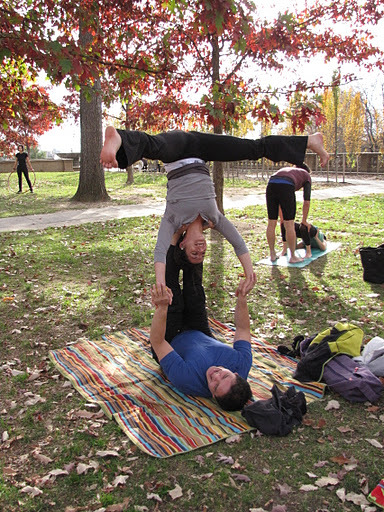 As the word implies, acroyoga combines yoga with acrobatics. 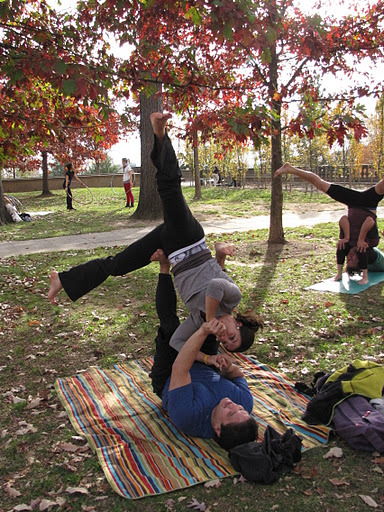 Each Sunday in Meridian Hill Park in the Adams Morgan neighborhood of DC, people get together to do their acroyoga thing. Flor has been telling me to check it out for a while. Last Sunday, the weather was nice, and Little Nellie was looking for a place to ride so we set out to the city to watch Flor fly. I love the Mount Vernon Trail. It’s as nice a bike ride as you can find, but I ride it every day on my way to work. 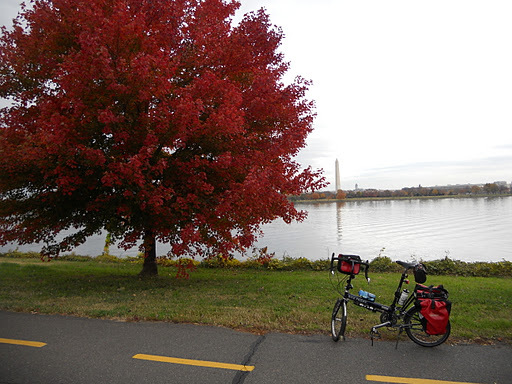 Instead of riding the trail from Alexandria to DC on the Virginia side of the Potomac, I decided to cross over into Maryland on the Woodrow Wilson Bridge Trail and ride to Adams Morgan by way of Oxon Hill Farm, Anacostia, and Capitol Hill. 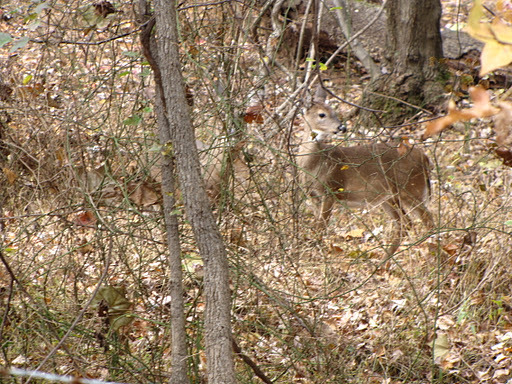 At Oxon Hill Farm, I took a path down hill through a wooded area. Out of the corner of my eye I spotted 2 wild turkeys. I stopped to take a picture but lost the turkeys in the browns and grays of the woods. 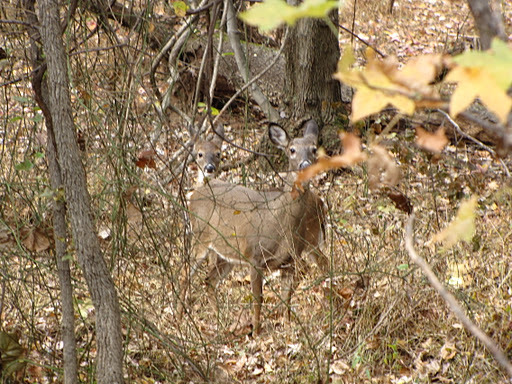 As I was straining to spot the turkeys, I came to realize that I was practically surrounded by deer. They blended almost perfectly into the trees. A mile or so farther along, the path emptied into a light industrial area. Tucked into the southernmost corner of DC, this little neighborhood contained a big job training center, a nursery with vast greenhouses, water and sewage treatment plants, the DC police academy, and a nondescript new police building. 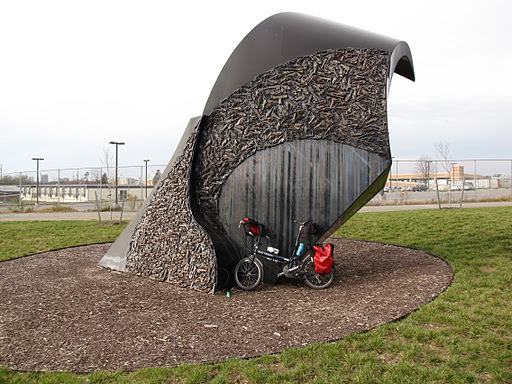 In front of this building stood an odd looking black and gray sculpture. It looked like a wave of some sort. Nellie went in for a closer look. Much of the sculpture was made from handguns. I wondered where they all came from. Actually, I don’t think I want to know. Moving on I made my way up yet another hill to Martin Luther King Boulevard. This took me across a series of smallish hills through some seriously poor neighborhoods. 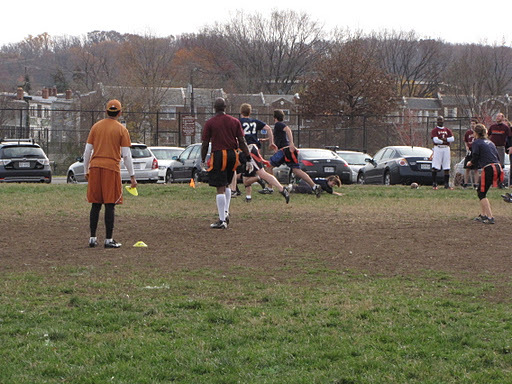 Just before entering Anacostia River Park, I spotted some posters of photographs hung on a chain link fence. Little Nellie posed with them. After stopping to take in some flag football, I rode out of the park, across the Sousa Bridge, and up Pennsylvania Avenue to Capitol Hill. I stopped at Eastern Market to grab a bite to eat. 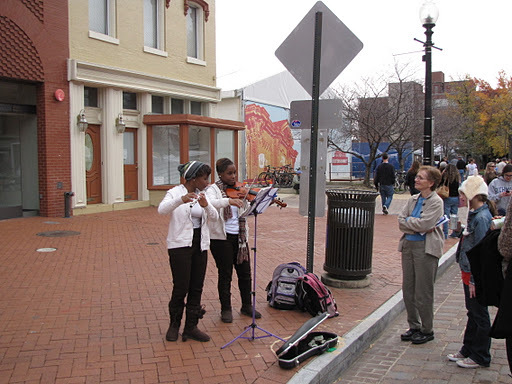 I briefly listened to a couple of young buskers playing pop music on flute and violin. Sometimes Flor was static either on her stomach or side, reaching out gracefully with toes pointed one way and hands pointed another, head arched upward. Other times she was rotating on Rafael’s hands or feet. Totally in control. Occasionally, she’d go upside down and hang. This looked pretty comfortable. 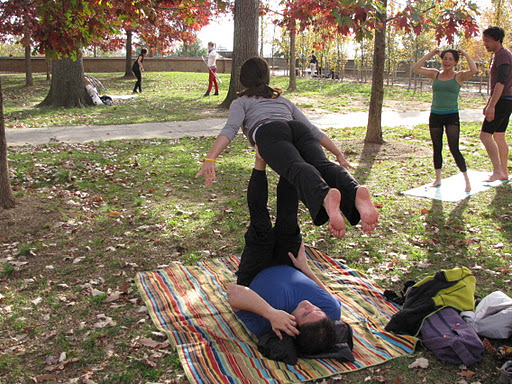 All the while Flor was flying, another couple was doing acroyoga a few feet away. They seemed less in sync but were, in their own way, pretty impressive. 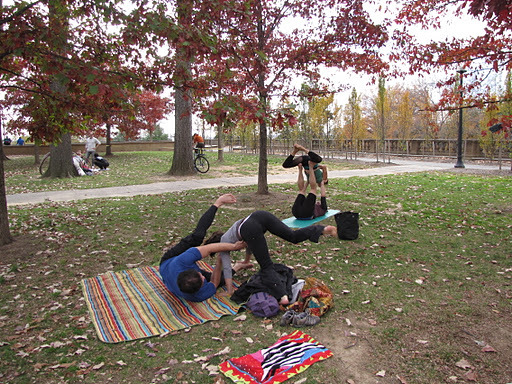 Across a park pathway, two women were exercising with hula hoops. 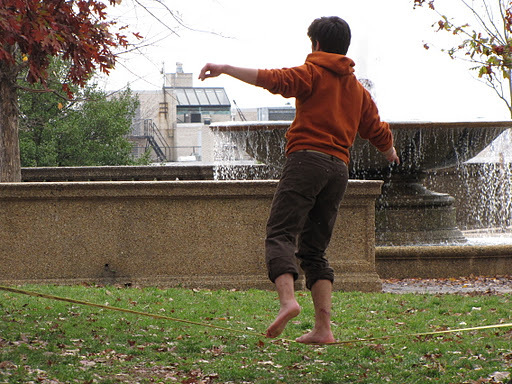 Then a man came and, using a ratchet device, slung a yellow tape between two trees and began to tightrope walk on it! Behind us, some more people showed up. Another guy deployed his tightrope between two more trees. I had somehow stumbled into a Cirque du Soleil training camp. After an hour or so, Flor and Raphael took a break. I had a chance to visit with my friend and thank her for inviting me to see this unusual scene. Our chat ended as several people, some with bongos in hand, came into our area. I was feeling a little like Toby Tyler. With only about 90 minutes of daylight remaining, I headed for home. All in all, not a bad way to spend a fall afternoon in the city. Every so often on my bike commutes I encounter something rare and I have to stop to check it out. Today was one of those commutes. I was cruising along in the drizzle of a gray November morning. I am sure that the folks in the cars on the parkway next to the Mount Vernon Trail were thinking, “Those bike riders must be miserable. Or nuts.” Well, setting aside my sanity, I can attest to the fact that I was quite comfortable. The temperature was near 60 degrees. I was wearing waterproof pants and a waterproof windbreaker. My feet were dry even though my shoes were not. I had slipped my stocking feet inside two plastic bags, the kind that the newspaper comes in. I had on my super duper water resistant long finger gloves. Basically, I was every bit as comfortable as I am on most sunny days. So in my be-drizzled comfort, I was spinning away when a splash of color caught my eye. At first I saw a young red maple along the trail that was showing it’s autumn stuff. Then right next to that little tree was the fabled balloon bush of Washington. I have heard old folks say that the balloon bush blossoms only once every 50 years. 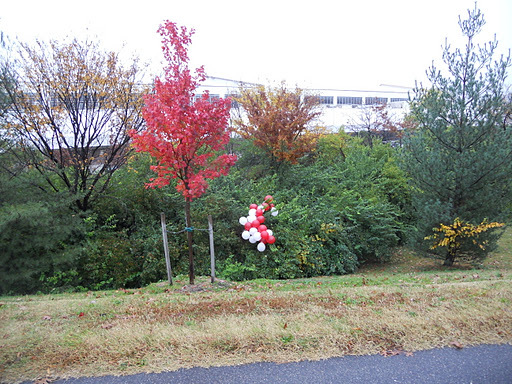 It’s blossoms of red and white balloons appear on the northwest side of the bush and only last a day or two. They say the balloons can be seen only by the certifiably insane. It’s one of nature’s great mysteries. Really, I stopped to take a picture. Please tell me you see the balloons. And tell the guys in the white lab coats to leave me alone. I typically complain in late October that the fall foliage is underwhelming. I did so this year and, boy, was I wrong. This has really been a superb year for fall colors. Other than a freak snowstorm, we’ve had fairly calm weather with light winds. That means the leaves hang in there a lot longer than normal. This week leaves are finally letting go and floating to the ground but a few trees are holding out for a few more days. On my ride to work this morning I saw one tree after another putting on a show along the Mount Vernon trail. Little Nellie finally made me stop and take a picture. 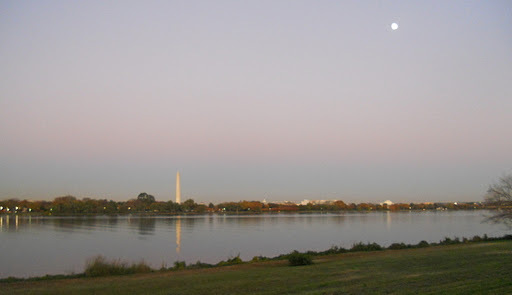 She posed with her friend Big Red with the Washington Monument in the background across the Potomac. In about a week the show will be over and we will be left to deal with bare trees, cold winds and gray skies. If you look closely, you can see some trees on the far river bank. They are cherry trees. Come April they will be putting on a show of their own. I can’t wait. Big Nellie Turns the Big 2-9! Big Nellie Turns the Big 2-9!, a photo by Rootchopper on Flickr. After crossing the 29,000 mark on my Specialized Sequoia touring bike a few weeks ago, I switched over to Big Nellie, my Tour Easy recumbent. They are in a dead heat. Tomorrow I switch back to Little Nellie, my Bike Friday New World Tourist. She’s been feeling neglected. She only has 6,000 miles on her. Just a young puppy. From Labrador to Key West! From Labrador to Key West!, a photo by Rootchopper on Flickr. 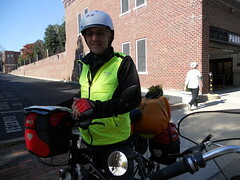 i often meet bicycle tourists when I ride around DC. Today I spotted this guy studying his map on the side of South Union Street in Old Town Alexandria. I asked him where he was from and he said Norway. Then I asked him where he’s going and he said “Key West”. Then I asked him where he was coming from and he said “Labrador”! That’s the first time anyone has said that in all the years I’ve been asking. 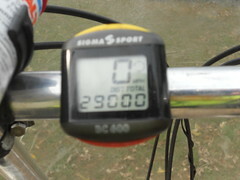 That’s something like 2,600 miles of riding. He’s a little over half way there. I asked him his name and he told me but I forgot. Let’s call him Lars. Good luck, Lars. Safe travels. 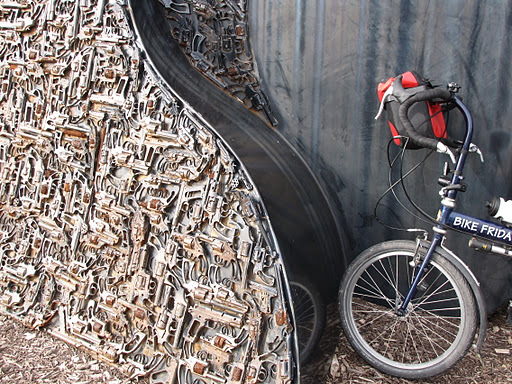 Bike Commute 128 – I Bike and I Vote, Baby, a photo by Rootchopper on Flickr. Big Nellie and I made a stop on the way to work this morning. 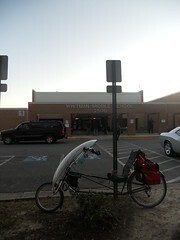 Here my trusty steed waits as I go inside to vote. I make a point of riding my bike to the polls (only about 1/2 mile from my house). I usually stick out from the crowd. This morning was different. A guy waiting to vote in front of me had on a yellow rain jacket, shorts and Shimano sandals with wool socks. Two biking voters at the same time! It’s like a new political movement! It’s our time! Use that democratic process to through out the car baggers! Or something like that. Postscript: I encountered Mr. Shimano Sandals about 30 minutes later riding to work on the Mount Vernon trail near the power plant. 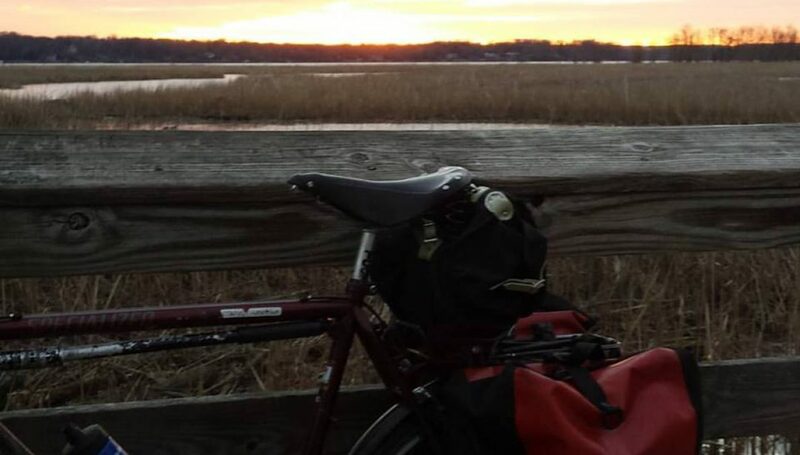 Post postscript: The incumbent member of the VA House of Delegates for my district, Scott Surovell, rode his bike cross country after graduating from college. Today was the first commute after we dialed the clocks back to standard time. With this adjustment I now have a morning commute in daylight (well, mostly anyway) and an evening commute in the dark. 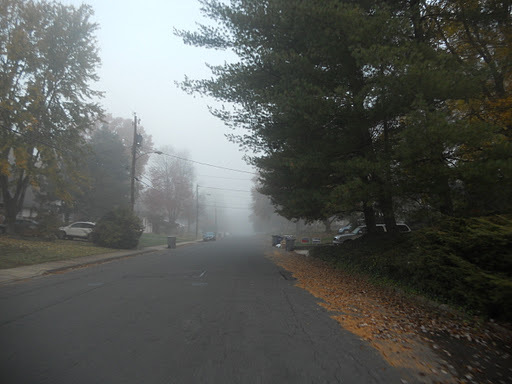 This morning I had to deal with dense fog for the first four miles or so. I was a little worried about visibility but my lights and reflectors probably make me hard to miss. I didn’t stop to take a picture of the layers of fog blanketing Georgetown this morning or of the Cathedral which seemed like a ghost in the clouds. The evening was fog free. The sun was about to set and I was cruising along the Mount Vernon Trail when I came upon this scene. I’ve lived here for 28 years and I never tire of the views of the city that I get from the trail. Not a week goes by when I don’t stop to take in the sights at least once. Bike Commute 125: You Prefer to Drive? 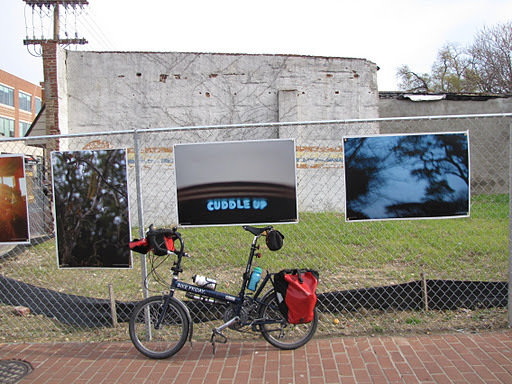 Bike Commute 125: You Prefer to Drive?, a photo by Rootchopper on Flickr. 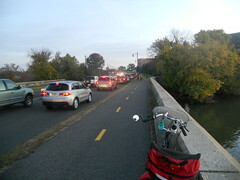 On my way to work, I noticed the traffic on the Parkway next to the bike trail. It was backed up about a quarter mile and it was still only around 730. I know not everyone can bike to work, but so many people say I’m nuts for riding my bike every day. Given a choice, why would any sane person want to sit in this traffic every day?